Almost three years after the beginning of the desert saga when the NHL bought the franchise out of bankruptcy in October 2009, we still don’t know what is going to happen to the Phoenix Coyotes in a near future. Will they stay in Glendale for the year to come, or will they move to another city where the organization will be more profitable? Will the Coyotes remain in Glendale? Now with the 2012 playoffs well under-way and the deadline to make a decision regarding the future of the franchise looming, let’s have a detailed look at this messy situation that has been dragging for a while, as the NHL and the City of Glendale will need to decide whether or not they will keep the Coyotes in Arizona despite years of financial losses. Potential owners are not scrambling to acquire this less-than-profitable franchise, especially after Matthew Hulsizer failed to reach an agreement with the City of Glendale in 2011. A deal had been reached between Glendale and Hulsizer that involved the sale of bonds by the city to pay Hulsizer over $100 million against future parking revenues at the arena. However, the Goldwater Institute, a taxpayer advocacy group, announced that it would challenge the lease agreement in court. The threat led to the failure of the bond sale and, as a result, Hulsizer abandoned his bid for the Coyotes on June 27, 2011. It’s not quite as simple as finding the best Samsung galaxy s3 deals, buying an NHL club is a very complex transaction. Now there is only one potential owner interested in buying the Coytes, namely Greg Jamison. Jamison is a former San Jose Sharks CEO who was once on the NHL Executive Committee. The businessman is well-known in the NHL and has a good reputation. However, Jamison doesn’t have the financial assets to buy the team alone and has tried to put together a group of investors to keep the team in Glendale. Jamison, who has been interested since August 2011, was close to a deal in February alongside other investors, but his group is still trying to secure partners and cash to close the deal. It will be interesting to see what role the NHL and commissioner Gary Bettman are playing in rounding up investors for the anointed Jamison bid in an effort to keep the Coyotes in Glendale. While the sale price of the Coyotes is unknown, speculations have been rampant regarding a potential sale price of $140-million for an owner that would keep the team in Glendale. But, since the NHL previously demanded $170-million and Bettman promised the league owners they would not lose money on the Coyotes, it would be difficult for the NHL to accept that offer. Especially since there are prospective owners willing to pay as much as $200-million if they are allowed to move the team to another city, including Pierre-Karl Peladeau and Quebecor who are waiting in the wings to buy the franchise and move it to Quebec City. Glendale city councillor Phil Lieberman is skeptical that Jamison has raised the money he needs and said that Ed Beasley, Glendale’s chief negotiator, refused a request for Jamison to meet with council to discuss his plans. It is reported that Jamison would be able and willing to put $100-million to purchase the team, which means he would need an up-front $40-million subsidy from the City of Glendale. The city would have to borrow the money through its Enterprise Fund, which is for sewers and water, and pay $1-million per year back into that fund for 40 years from its General Fund. This financial maneuver will certainly attract the attention of the Goldwater Institute as the $40-million payment would not pass legally under Arionza’s gift clause. In addition, Glendale would pay $16-million per year to Jamison as a management fee for the arena. The argument would be it is keeping the Coyotes for only $17-million per year (the loan payment plus the management fee) compared to the $25-million it paid for the 2010-11 season and this season. However, earlier this month, outgoing Glendale Mayor Elaine Scruggs said during a diatribe against the NHL she would never vote for a management fee of more than $11-million. Hence, the never-ending negotiation between Jamison and the city in order to find a compromise regarding the management of the arena. There is a concerted effort by the league and Glendale to avoid a repeat of Hulsizer’s pursuit of the Coyotes. The Goldwater Institute watchdog group helped unravel that deal when the city tried to sell bonds aimed at financially facilitating Hulsizers’s purchase of the team. Phoenix-based Goldwater threatened to sue the city over the bonds citing Arizona’s gift clause ban on overzealous government subsidies to businesses. Goldwater attorney Carrie Ann Sitren recently said her group has not received much information lately from Glendale about the Coyotes deal, but is ready to scrutinize a possible deal with Jamison or any other prospective owner. This is why the NHL and Glendale will need to be very creative in order to conclude a deal that doesn’t contravene the state constitution’s gift clause. 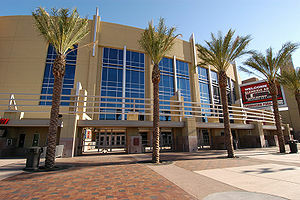 An arena management fee also has the potential to make or break a Coyotes sale coming from the city of Glendale. Mayor Elaine Scruggs and councilman Phil Lieberman don’t want spend a lot of money to pay a new Coyotes owner to run the arena. Other members of the City Council either will support a Coyotes arena payment (i.e. subsidy) no matter what or feel resigned that they have to save the team to keep Jobing.com Arena and Westgate viable and prevent the building from turning into a white elephant. Yet, Glendale is facing a deficit of as much as $30-million for the upcoming budget. Unpaid furloughs for policemen and fire fighters, and cutbacks to public services are likely in the next year, which makes big payments for the Coyotes a tough sell to taxpayers. Also, a majority of the six members of the city council will need to approve the next budget before concluding a deal with Greg Jamison, and in case of a deadlock, Major Elaine Scruggs will have the swing vote. While the Coyotes are selling out their home games during the Stanley Cup playoffs, it is a totally different story for the regular season. According to ESPN, Phoenix has been among the worst teams in the NHL in attendance for the past few seasons, and the number of fans attending Coyotes home games has been declining since the lock-out as shown below. You can see a decline in attendance since the team went bankrupt in 2009, but even prior to that, the Coyotes had not managed to rank in the top-20 attendance-wise despite having a capacity of 17,125 fans (17,539 with standing room) at Jobing.com arena. Finally, the biggest challenge to the Coyotes deal remains to find an owner willing to sustain massive financial losses in the Arizona desert for the years to come. According to Forbes, the Coyotes are being worth about $134-million, with around $24-million in losses per year. That makes the Coyotes the cheapest franchise in the NHL behind the New York Islanders and the Columbus Blue Jackets which are worth $149-million and $152-million, respectively. Unsurprisingly, The Toronto Maple Leafs, the New York Rangers and the Montreal Canadiens lead the way with an overall worth of $521-million, $507-million and $445-million, respectively. McCown also said they are past the April 15th, 2012 deadline to resolve the situation Bill Daly told him about earlier. But can the Coyotes be profitable over the long term? Cost of running an NHL Franchise : $75M to $95M depending upon travel, so let’s say $95-million because the Coyotes play in the Pacific Division. If the new owner of the Coyotes doesn’t increase the average price per ticket to a minimum of $60 and the team doesn’t attract at least 16,000 paying fans per game ($60 x 43 games x 16,000 = $41.28-million/year in ticket revenue instead of the current $19-million) the organization will never turn a profit in the Arizona desert. While the above numbers remain to be confirmed, they give us a good idea of the Coyotes’ overall situation and the thin possibility that Greg Jamison will turn his investment into a profitable endeavour. Jamison and his group of investors will need to have a strong back in order to survive massive financial losses in the first few years following the purchase of this franchise if they want to have any hope of turning things around in the desert and avoiding to go bankrupt like the previous owner, Jerry Moyes. Jamison will need a strong marketing team to convince the fans to come in greater numbers to the arena despite almost doubling the sale price of the tickets if he hopes to even break even! Do you think the Coyotes will be in Phoenix this season? Or do you think this whole saga is about to come to an abrupt end after the interested parties, namely the NHL, the City of Glendale and Greg Jamison, can’t conclude an agreement because of the above roadblocks? You can follow me on Twitter for more information on the NHL.